Former Warriors and Dynamos coach Calisto Pasuwa looks set to make a return to the Malawian TNM Super League ahead of the new season after reportedly agreeing a new three-year contract with Malawian football giants Nyasa Big Bullets. 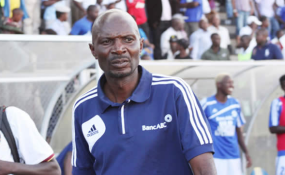 The 48-year-old coach initially signed a short-term contract with the Malawians in October and achieved the initial target of winning the league title. And according to reports from Malawi, Nyasa Big Bullets have tied Pasuwa down to a new long-term deal with the latter agreeing "in principle" to a new contract after weeks of negotiations. Nyasa Big Bullets chief executive officer Fleetwood Haiya confirmed that Pasuwa has agreed to the terms and all that is remaining is to finalise the paperwork. He blamed the delay to seal the deal on lack of access to social media and internet services in Zimbabwe following nationwide protests over the country's economic crisis. "Had it not been for the communication problems being experienced in Zimbabwe, in particular internet, we could have finalised the deal by now," Haiwa told the Malawian publication The Nation. "But we will get it over and done with soon," said Haiya. Pasuwa imminent return to Malawi comes after his initial two and a half months contract with Bullets expired at the end of last month. The former Zimbabwe Warriors and Dynamos FC coach took over the mantle from Rogers Yasin and Elia Kananji in October last year and was given a target of winning the TNM Super League title as a condition for a long-term romance with the People's Team. He took over the team when it was already on course to win the league but did the rest to perfection by sealing the title with a game to spare. The only disappointment under Pasuwa's watch was the failure by the club to make a mark on the continent after they were knocked out in the first round of the CAF Champions League. Pasuwa is one of the most successful coaches in Zimbabwe having won four consecutive Zimbabwe Premiership titles with Dynamos before leading the Warriors to the 2017 Africa Cup of Nations finals held in Gabon.